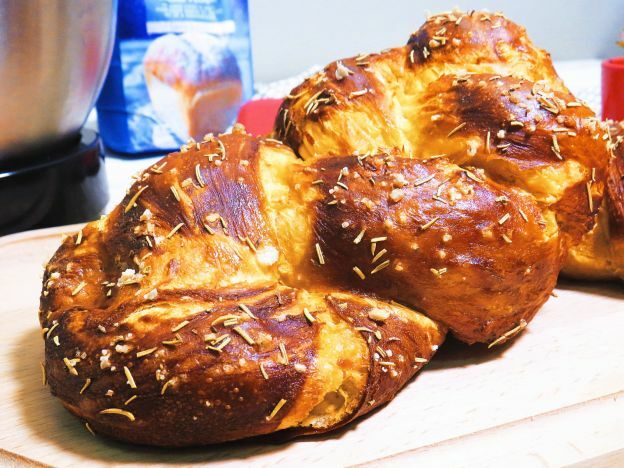 This Cheesy, Savory Pretzel Challah is Absolutely Irresistible. 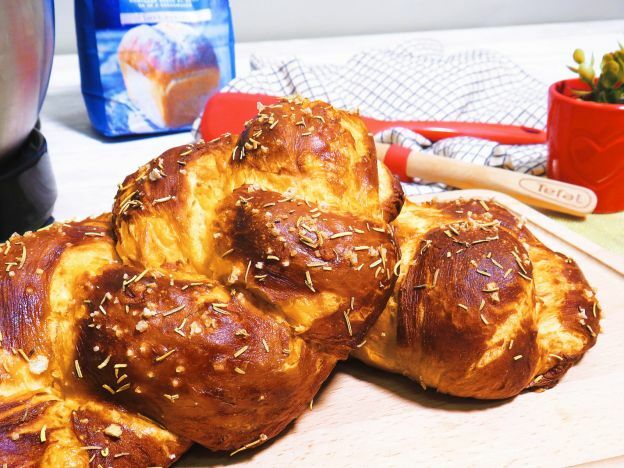 Cheddar and rosemary elevate this pretzel challah to divine deliciousness. The traditional Jewish challah bread is reimagined in this recipe, turning it into a charming snack to be enjoyed with a cold beer, or topped with a dollop of tomato jam. 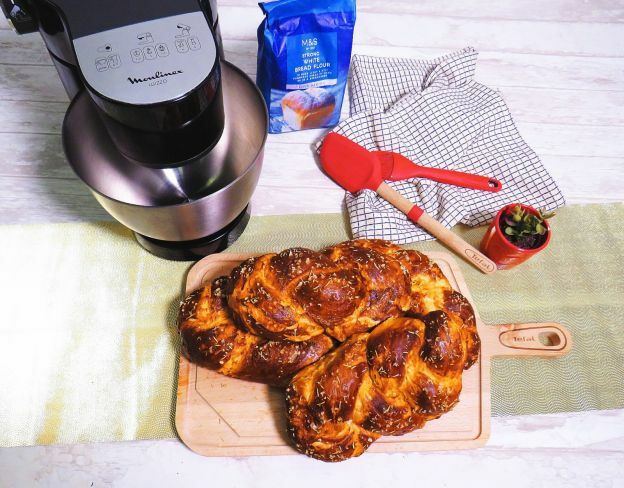 Whatever way you slice it, this pretzel challah will quickly be replaced by crumbs on your kitchen counter. *The amount of flour you need is influenced by many factors, like the time of year and humidity. The minimum amount of flour you need is 3 1/2 cups. To make pareve, skip cheese portion. To make the night before, skip step 4, cover bowl with plastic wrap and put in fridge overnight. Pick up instructions from step 8 and follow the remaining directions. 4. Boil a small pot of water on stove. 5. Wash out your bowl and oil it. 7. Let rise for one hour. Punch the rising dough down and let rise for one more hour. 8. Knead dough on a lightly floured surface and cut into 4 equal parts. 9. Roll out 1/4 of dough until approximately 1 cm thick. Sprinkle cheese over the dough and start to roll it away from you into a log. 10. Cut log into 3 parts and roll each part between the palms of your hands until it ressembles a snake about 10 inches long. Repeat with other two pieces. 11. Place the 3 strands side by side and begin braiding the strands. Tuck the end piece under the loaf. 12. Repeat steps 9 through 11 with other pieces. 13. Place the braids on baking sheets (2 per baking sheet) and allow to rise for 30-45 min. Dough is ready when your finger leaves an indent that does not fill. 14. Boil the 9 cups of water with 1 cup of baking soda. 15. Gently lower 1 loaf at a time into boiling liquid, and allow to sit for only 20 sec. Remove with slotted spoon and place on baking sheet. Repeat with each loaf. Preheat oven to 350 degrees. 16. Mix 1 egg, 1 tbsp water and a pinch of salt and brush it lightly over each loaf. Sprinkle coarse salt and dried rosemary over the tops of loaves. 17. Put loaves in oven for 15 minutes. Brush loaves with egg mixture and turn the pan. Continue baking for 10 minutes. 18. Bread is ready when it makes a hollow sound when tapped. Hungry for more? Check out this 5-Ingredient Sun Tart with Tangy Blue Cheese & Fig Jam. Tasty Milkshakes with a Healthy Twist Best-By Dates: What Do They Really Mean?